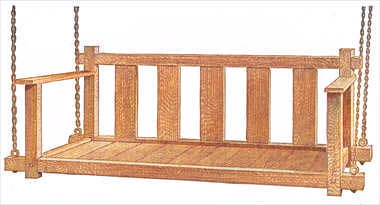 Click here for detailed porch swing plans. 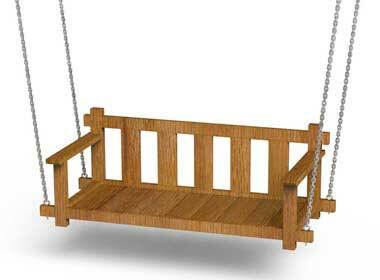 The swing should be suspended by rustless black chains and eyebolts passing through the lower rails. These pieces, dressed and sanded, may be bought at the mill. 2 rails, 1-3/4 by 3 by 71 in., S-4-S.
1 rail, 1-3/4 by 3 by 65 in., S-4-S.
2 posts, 1-3/4 by 3 by 25 in., S-4-S.
2 posts, 1-3/4 by 3 by 17 in., S-4-S.
2 rails, 1-3/4 by 3 by 22-1/2 in., S-2-S.
2 arm rests, 7/8 by 4 by 28 in., S-2-S.
5 slats, 3/8 by 5 by 16 in., S-2-S.
8 ft. flooring for bottom. 2 cleats, 7/8 by 1-1/2 by 57 in., S-4-S. Plane and square the ends of all the rails and posts. Lay out the lap joints for the back rails and posts. Use a knife line for this and saw exactly to the line to avoid trimming with the chisel. When sawing be careful to cut exactly halfway through the thickness of each piece. In the same way make the lap joints between the front rail and posts. Have the two end rails exactly the same length and proceed to fasten the front and back posts to them, using 4-in. 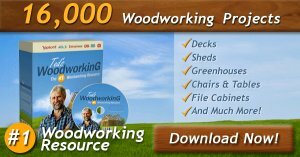 lag screws and washers. Bore through the posts and part way into the ends of the end rails for the lag screws. The slats are mortised 1/2 in. into the back rails, or a 3/8-in. groove may be planed in these rails, the entire distance between joints, to receive the slats. A rabbeting plane will be needed for this. The arm rests lap over the back posts and are held to them  with 2-in. round-head screws. They may be fastened to the top of the front posts with round-head screws or dowel pins. Ordinary pine flooring makes a good, tight seat, or 7/8-in. board may be used if desired. Fasten the cleats, which support the seat, to the front and back lower rails with 1-1/2-in. screws. Finish the porch swing with stain and two coats of waterproof varnish.